Couscous symbolizes happiness and abundance, according to some culinary anthropologists. 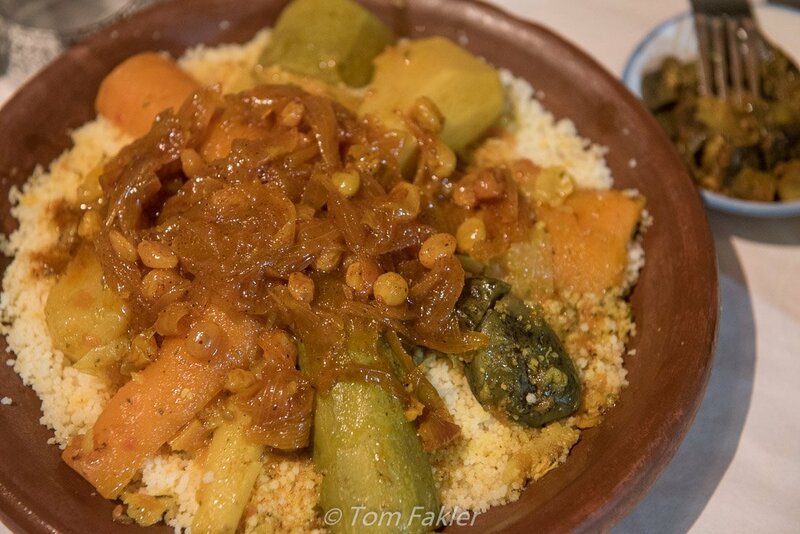 In Morocco, to be invited for the Friday mid-day meal means “Join us for couscous”, and it is a privilege indeed. To me, there is no better time or place for enjoying the North African staple than in a Moroccan home. Just like Italian pasta, it is possible to buy sub-par couscous. One of the more heated exchanges I’ve witnessed in Morocco was a grandmother berating her grandson for careless shopping. “You’ve brought me terrible couscous!” she chided. “I’ve had to wash and wash this couscous, just to make our guests a decent Friday meal.” That couscous was delicious, as it turned out, but she’d made her point. Ever since then, I’ve been conscious of Tamou’s stringent requirements for good couscous, and smile when I think of that day in the Atlas mountains. 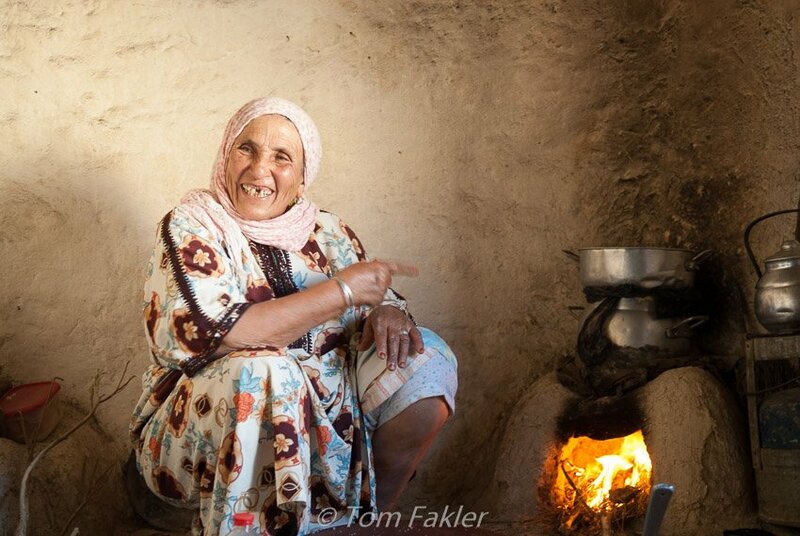 Tamou making couscous over a wood fire. It was yummy! It takes time to make the Friday meal, the equivalent to the Sunday pot roasts of my childhood. This is the big meal guests are invited to, so the pressure is on to put the best platter of food possible on the table. 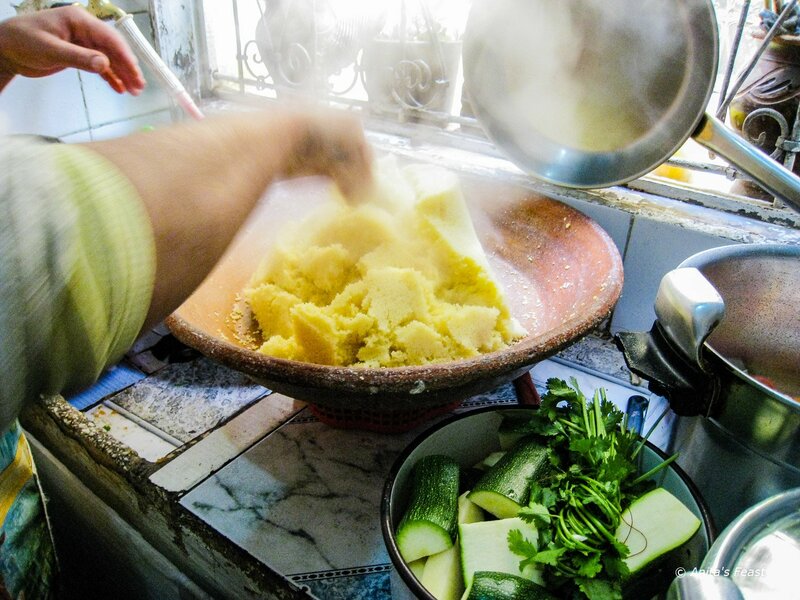 I have repeatedly been amazed at the care every Moroccan home cook takes to prepare her own best version of couscous–taking plenty of time and coaxing the most flavor and texture from the grains. Steaming over flavored broth: just one secret to good couscous! Friday couscous is not just a plate of semolina grains, of course, but a platter lovingly prepared and topped with all manner of goodness. 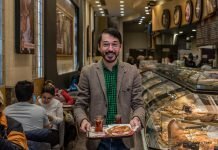 Perhaps most importantly, it is a meal to share with family and friends. From those first days in Morocco, when Tom and I ate our couscous with knives and forks in a restaurant, to the time we enjoyed a communal platter of couscous topped with stuffed, pull-apart chicken in the mountains using our right hands as utensils, was a short but important step. We learned then, and have seen time and again, in the years since, how much pleasure can be shared around the Friday table in Morocco.